Can Jonathan Drouin Aid Lightning Offense? By now Tampa Bay Lightning fans have heard or read the news about Steven Stamkos and his scheduled surgery set for this Monday. Diagnosed with a blood clot near his collarbone, this is the same type of surgery that goalie Andrei Vasilevskiy went through last September. While it is extremley disconcerting any time a team loses its leading scorer days before the playoffs begin, this situation may have a reasonable quick fix. That stopgap measure may be in Syracuse and his name is Jonathan Drouin. Make no mistake, no player including Drouin can make up for Stamkos who is a world-class NHL sniper. But Drouin has NHL experience and is a highly skilled offensive player. Yes, there is the pesky issue of his trade request but in hindsight, Lightning General Manager Steve Yzerman looks brilliant going against conventional wisdom by not trading Drouin at the February deadline. After ending his ill-advised holdout and returning to Syracuse, Drouin has scored nine goals in 15 games. All toll, he has notched 11 goals in 17 games with the Crunch. Other than the old “My alarm clock didn’t go off” excuse which caused Drouin to miss a team practice a couple of weeks ago earning himself a one game suspension, his behavior has been highly commendable at Syracuse. Recalling Drouin will not be popular for the Lightning fan base but Yzerman won’t be dictated by this at all. Most fans wanted the young forward traded, some even said for a bag of pucks. Yzerman remained steadfast in not pulling the trigger on a deal last month that would have shipped Drouin out of the franchise that drafted him number three just three short years ago. It may turn out that the biggest deal Yzerman made this year is deciding to hold onto Drouin. I realize that most in Thunder Nation are going to take umbrage with me but I think Drouin can help the team out. Even if Drouin still wants out of the Lightning organization, a call up in the last few games provides him a platform to show 29 NHL GM’s exactly what he can do under the pressure to perform for a team that lost their top scorer. Again, Drouin or anyone else on the Lightning roster isn’t going to replace Stamkos but providing an offensive spark, scoring a goal or dishing an assist will not only help the team but turn some GM’s heads. As the team plays out the remaining regular season games, we are about 10 days from the start of the playoffs. The Lightning still have the Triplets line. Which now becomes their number one line. Tyler Johnson, Ondrej Palat and Nikita Kucherov are as formidable a line there is in the NHL. The roster still contains names like Valterri Filppula, Ryan Callahan, Alex Killorn as well as up and coming players like J.T. Brown, Vlad Namestnikov and Jonathan Marchessault. These last three set career highs this season in goals. Adding Drouin to this mix can only help offensively. The prognosis for Stamkos is that at the earliest he could be back in one month. Vasilevskiy was cleared to play 47 days after his surgery. If Stamkos heals in a similar fashion, he should be back for the Eastern Conference Finals should the team get that far. A return trip to the conference finals isn’t a lock and it will take a certain amount of luck to go along with strong team play. Stamkos missing a game was in itself news as he hasn’t missed a game since he broke his leg in Boston in November of 2013. After getting off to a torrid start that season, it was said that without Stamkos the team would fold up like a cheap tent. At the time, no one outside of Tampa had heard much of Palat and Johnson. They helped carry the load when Stamkos missed over 40 games that year. It led to both of them earning two of the three finalist spots for the Calder Trophy that season for rookie of the year. 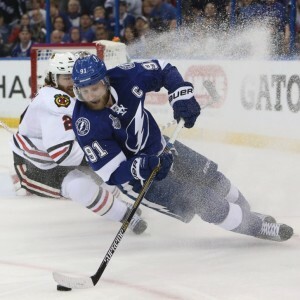 Stamkos’ leg injury forced the team to rely on virtual unknowns that year and Palat and Johnson came through as they helped lead the team to a playoff berth. This current Stamkos setback could open the door for Drouin to begin to reach his potential in similar fashion. The Lightning still have one of the league’s best goalies in Ben Bishop and one of the best defensemen in Victor Hedman. They have another 30 goal scorer in Kucherov, along with other exciting, highly skilled players on the roster. Drouin could be the additional piece to help this team further until their captain can take his spot back. Stranger things have happened. I do realize that this suggestion will be met with indignation from the Lightning faithful. As I have already noted, most fans in town still want to ride Drouin out on a rail. They are done with this kid. They see his trade request as an affront to their team, to Yzerman and to the franchise. But one of the team leaders, Brian Boyle has already publicly stated that while the guys in the locker might not have agreed with the way the Drouin saga played out, they would welcome him back. There are a lot of ifs surrounding this move. If Drouin has his head on straight. If his return won’t be a distraction. If he can find the offensive production that his potential once showed. If he has a new alarm clock. So many damn ifs. But if all of this can work, then maybe, just maybe this is exactly the type of move that can help this team get over this rather large hump imposed by the Stamkos news. One thing for certain is that the Lightning organization has depth. They have proved it this year as they have suffered quite a few injuries throughout the season. Starting with Vasilevskiy’s surgery to repair the blood clot in his collarbone, through the surgery their captain has scheduled for Monday for the exact same thing. Drouin is just one cog in that team depth that can prove to be a blessing. Imagine if he plays even a bit to the glimpses of what we all have seen in his brief pro career. He can win back the fans. He can convince management that he can be a team player. He just may find the right path that he was on the day he was drafted. As I have said, stranger things have happened.